The Football Association has said it expects next season's FA Cup final to be held at the new Wembley - despite builders saying it will not be ready. Multiplex said the £757m north London stadium would not open until June 2007. But an FA spokesman said there were no plans to book the Millennium Stadium in Cardiff for the final in May. 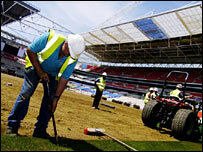 "The FA remains confident that Wembley Stadium can be ready for [next] season's FA Cup final," said the spokesman. Wembley had been due for completion in August 2005, but hold-ups led to events such as the 2006 FA Cup final being rescheduled and played in Cardiff. An FA spokesman said its confident pronouncement followed talks with Wembley National Stadium Limited (WNSL), which owns the venue. So typical of British workmanship that yet again another building is behind schedule and over budget. "This is of course dependent on when stadium constructors Multiplex meets all of its contractual obligations," said the spokesman. He added: "We do have to factor in that Multiplex have, to date, missed all key deadlines." Multiplex said WNSL needed to stage test events so the stadium could gain the required licences and approval to operate. Multiplex director of communications Peter Murphy told BBC Radio 4's Today programme: "The problem at the moment in terms of when the stadium becomes operationally complete, or reaches practical completion, really surrounds commencement and completion of the client works. "So at this stage, Multiplex as builder is reliant upon our client, WNSL, completing a series of critical works to get us through to the point where we're capable of actually hosting or running test events and, at this stage, we're unclear and we haven't been informed by WNSL when in fact they'll commence and complete those works." But a spokesman for WNSL said: "The contract with Multiplex has two critical future milestones which Multiplex have deliberately confused. "Multiplex is required to hand WNSL a completed stadium which is defined in the contract as 'practical completion'. "WNSL then has to work with Multiplex to finish certain works and to hold the various test events which will enable the safety certificate to be obtained and achieve 'operational completion', the point at which a fully-functioning stadium is delivered, capable of holding full-capacity events for 90,000 people. "When Multiplex do hand us the completed stadium, we have a detailed timetable of our works and test events which subject to co-operation from the contractor, should enable 'operational completion' to take place within two to three months of handover." "We are still not in a position to name an opening event or rule any event in or out as we need Multiplex to make more progress on site."